Creating sensory experience packaging is every smart brand’s dream. A stat from Perception Research Services (PRS) states that 80% of the new brands in the retail business fail because of the poor packaging. Equal importance has to be given to the packaging as much as you give to the product design. 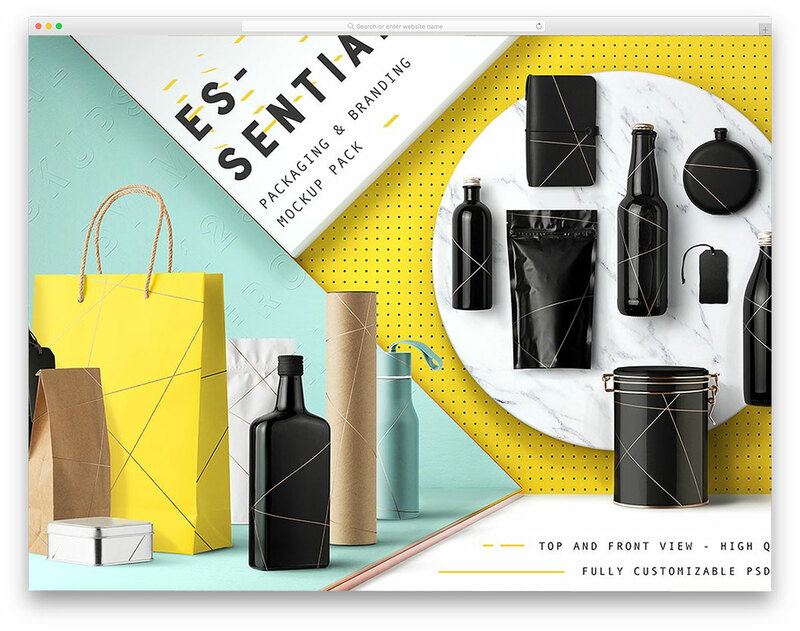 If you are making such beautiful design that helps you to make a connection with your customers, this Packaging mockups will help you present your design elegantly. Do you know, Apple has a separate executive whose only job is to open the boxes and report its experience. We all know about Apple, they took each and everything carefully, which makes the brand so successful. Every user out there will remember their first Apple product unboxing. From the taglines to plastic covers everything will be stored in the user’s sensory memory. This is what something every brand’s packaging needs, sensory experience. Each and every time when a user comes across that sensory action, your brand will be triggered in their mind. This sensory action can be the feel, scent, colors, and whatever be it is, it must be unique to your brand. One of the recent packaging designs that the tech industry has been talking about is the new Xbox adaptive controller packaging. The packaging itself is self-explanatory, lots of loop design for easy access, you can check the design video here for inspiration. For those who are putting immense effort in creating such a memorable packaging, this packaging mockup will help you a lot. You can concentrate more on your design, not on the presentation. Simply put your design on this mockup and present it elegantly to the users and your clients. 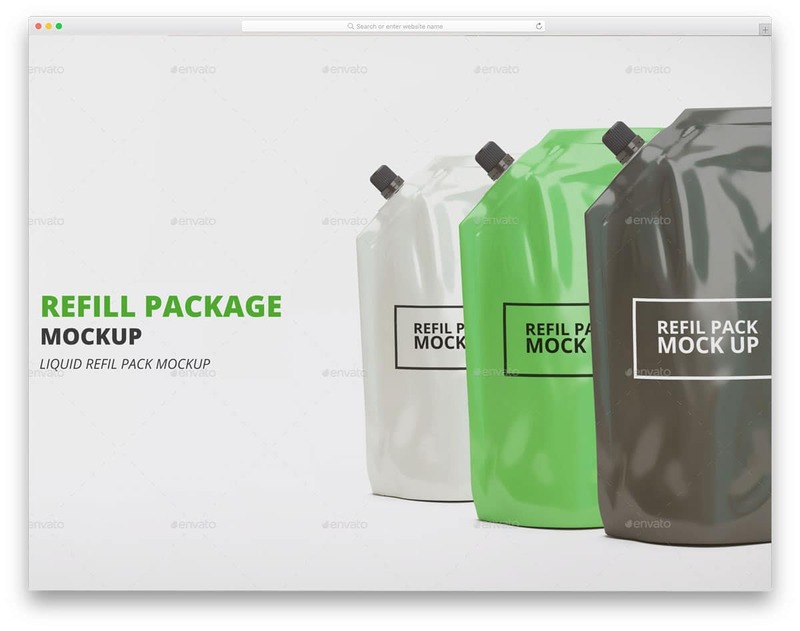 Packaging Mockup Collection will become one of your favorite packaging mockups in your collection. If you are a design agency or freelance designer, this mockup will help you present your designs elegantly. The designer has included both front and top view of the product to help the users get a better idea of your designs. 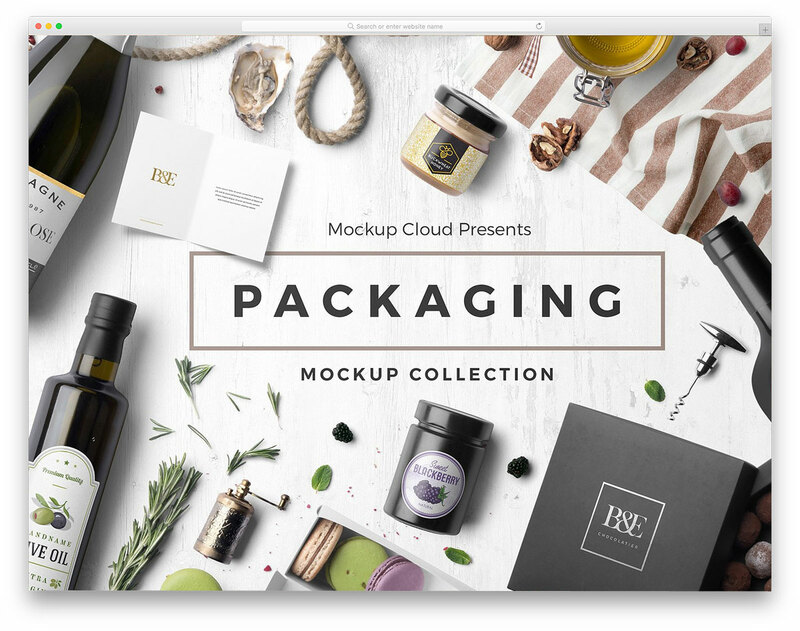 This mockup collection has 600+ elements and the beauty is you can edit all of them. All the major type of packagings like box type packaging, bottle packaging, covers, sacks and a lot are included in this set. For professional designers, this mockup will greatly save your time and also help you to present your designs neatly. Since the file size of the mockup is large, the user has included a PDF page with links in the download file. From the links, you can easily download the PSD files. Packaging is one of the biggest challenge online stores faces. Based on the product, your packaging varies and you also have to make sure that it reaches safely in customers hand. When you see the Microsoft’s Xbox adaptive controller packaging, they have even taken care of the shipping cardboard design. Two support elements on the sides, make sure that the product inside doesn’t damage by rough handling while shipping. If you are making a box design for an online fashion store or apparel store, you should check out this mockup. 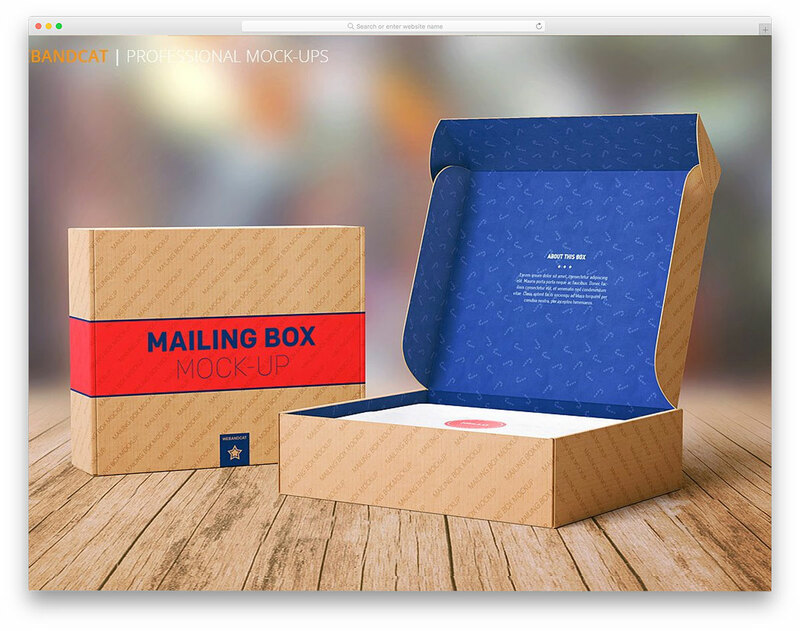 The designer of this mockup has given you complete freedom to customize the look of the box. You even have space to add a few lines of texts on the inner side of the box, which you can use to give a personal touch when the customer opens your box. Wine packaging is in the industry for several decades. Companies use the latest packaging techniques at that time to make their product unique. Some of the wine bottles are very costly, which falls in the luxury category. So the companies need to make their bottle rich and also let the user feel the extra money they spend on a costly drink. The designer of this mockup has included several photos taken in different perspectives. With this mockup, you can clearly show every corner of your design to the users. 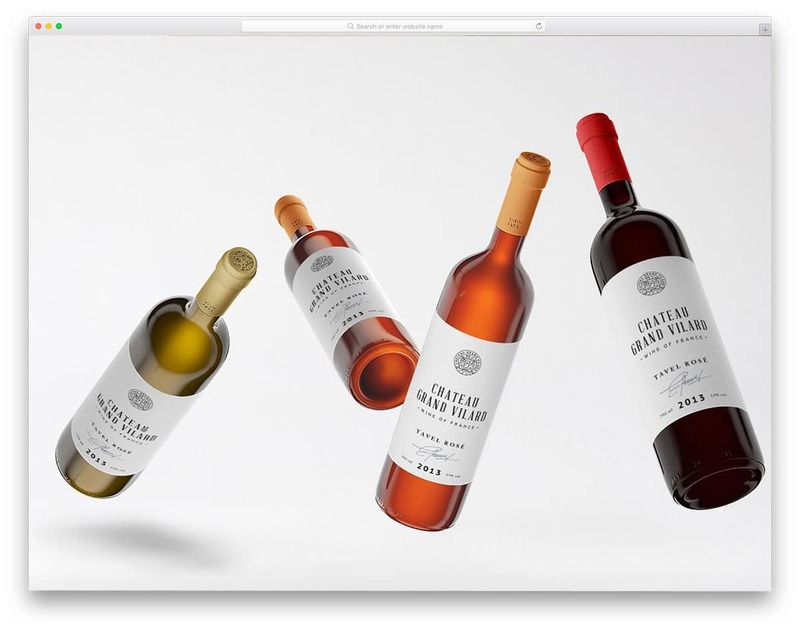 This mockup file includes 15 PSD files with three different wine bottles. Based on your design choose the one that best fits your needs. All the mockups are easily editable and you can also change the background image or colors. Using loops in the box designing helps the user to easily unpack your product. Most of the loop designs are self-explanatory and let the user know what they need to do next. As you can see in the Xbox adaptive display design, lots of loops are used at each and every stage of unboxing. This type of design can be used for any type of product from apparels & accessories to electronic gadgets. The designer of this mockup has only given a simple loop box design, which you can use to showcase your exterior design. 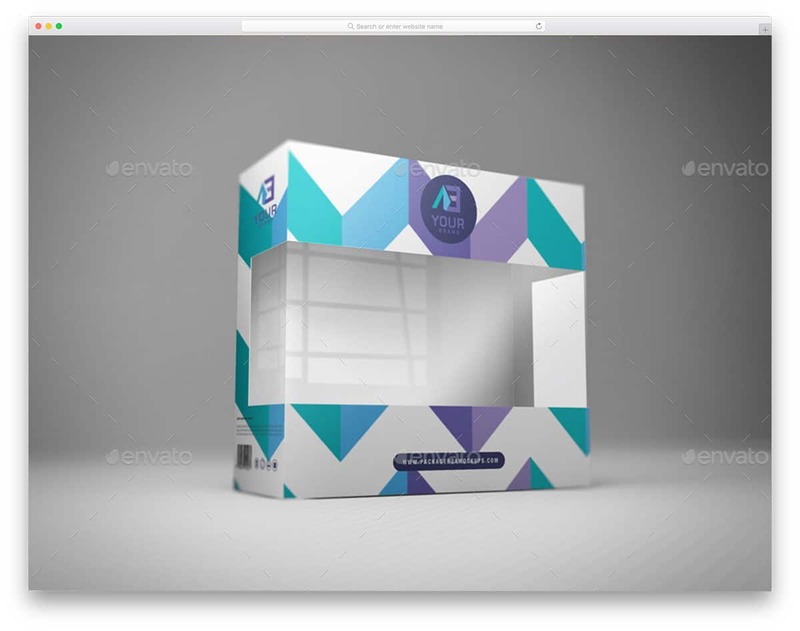 Boxes with two sizes are given in this mockup to give your customer a clear view of your design. In the download file, you get seven PSD files and all of them allows to edit almost all the elements. When you think of packaging design, the box design is the most frequently used one. The biggest advantage is you can easily arrange them and ship them in mass volume. Based on the product inside you can add an extra layer of protection within the box itself. If you have unboxed Apple’s previous Mac products you will get a soft velvety finish inside the box; it gives a rich feel and also protects the product from scratches. 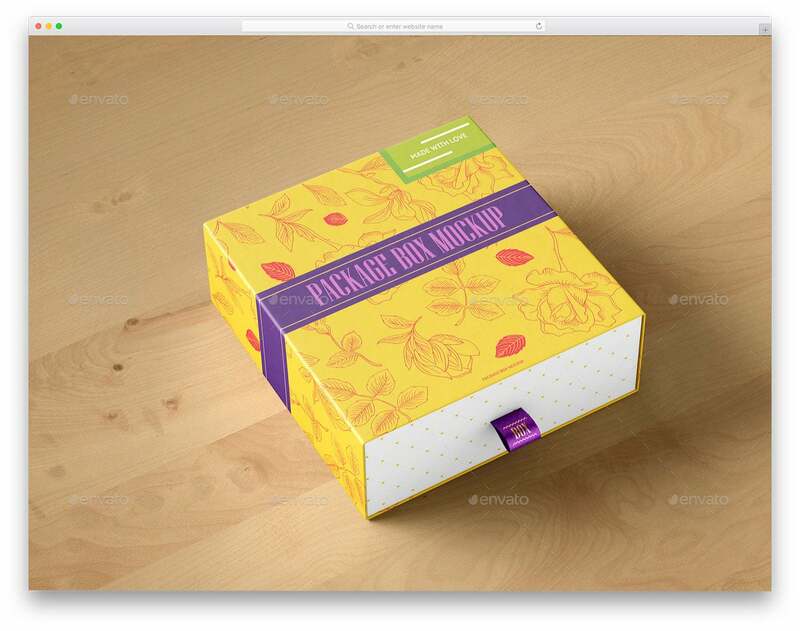 If you are making any such box design, then this is the mockup for you. Of course, the designer has only given you a simple box in this mockup to show your exterior designs. Boxes of all the normal sizes are given in this mockup so that you can use this mockup for almost all type of products. This mockup set is designed exclusively for the branding agencies and design agencies. If you are mostly concentrating on the bottle packaging, this mockup will come in handy for you. Several types of bottle packages are given in this mockup set. Along with the bottle packages you also get other normal packagings like covers and boxes. 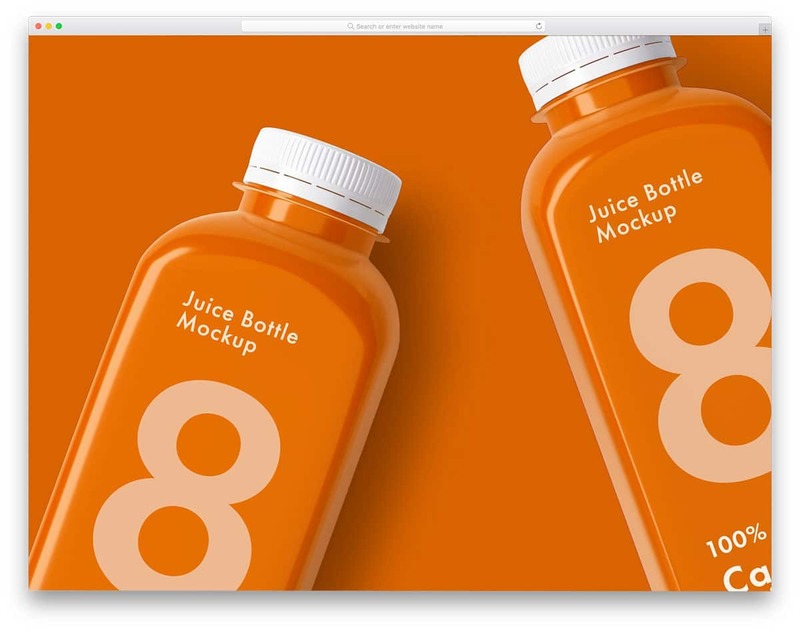 All the layers of the mockups are properly optimized so that your design will look natural on the bottles. Like the above-mentioned mockup sets, this one also has the top view and front view images. Reflections on the bottles are handled properly so that your designs can be seen clearly. All the items are easy to customize, you can add your own colors and logos without dropping a sweat. Big package boxes are still the most favorite packaging method for shipping services. Especially if you are selling pets like fishes, this package is the best option to make your pets reach safely. Other than pet store owners, wholesale packers are also prefer this box design. Rather than simply sending a plain box it is better to brand it or present it creatively to the users. The designer of this mockup has given the image in all the angles. Using this mockup you can clearly show your box design. Shadows and neat foldings give a realistic view to the image. Since the mockup has open box design, you can also add some designs on the inner side of the package box. Bottles also play a major role in the packaging industry. Many liquid items are safely reaching us because of the bottle packaging. New materials are used instead of glasses to give you a safe unbreakable bottle. No matter what material you are using for your bottle packaging design, this mockup will help you present the design elegantly to the user. The neat simple design of the bottle clearly shows your design. Reflections on the bottle are handled properly to give you a realistic experience. All the layers are handled professionally so that you get a high-resolution image in no time. Refill packages are one of the most commonly used packages in food products. Some creative brands keep some elements in a pattern and vacuum seal it in their refill packaging; so that you get a 3D image. The user also can touch and feel. If you are having some creative design ideas, refill packages are the best option. You get different perspective images with this mockup. All the images are easy to edit and also clearly shows your design. The shadows are preserved so well, hence the user will get a realistic feel when they see the image. Like the all other packaging mockups this one is also made with Photoshop. The creator of this mockup has given you three different types of reflections. Based on your design, you can choose the one that adds richness to your design. Chocolate Bar packaging the place where you can be creative and funny, based on the brand. Most chocolate bar packages have bright colors and creative designs. 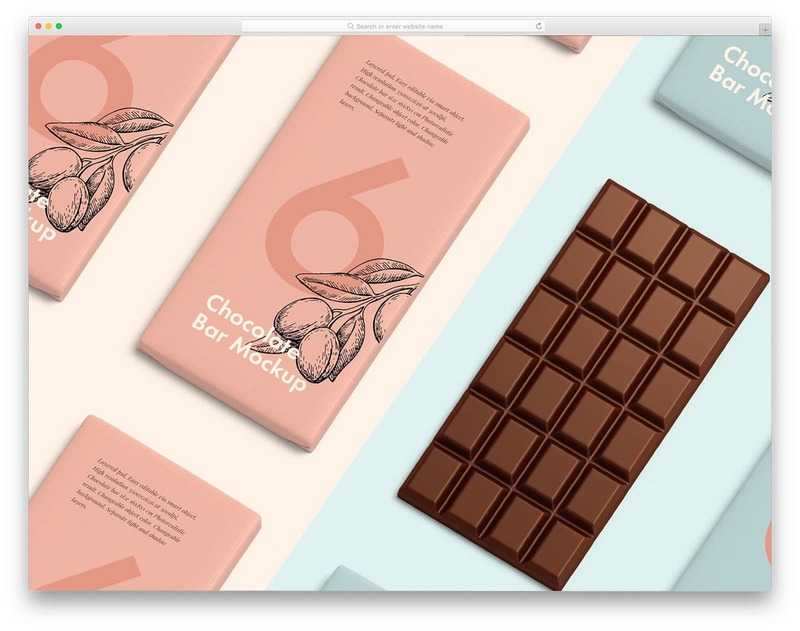 But, in the case of luxury brand chocolates, the design is different. Whatever be your design, this mockup can handle it easily. You can use this mockup to show some rich designs and also show some funny attractive designs. The default mild color scheme of the mockup itself gives a clean look to the packages. You can easily add your designs and showcase it in your portfolio. Since it is a high-resolution image you can zoom in and show your design neatly to the clients. 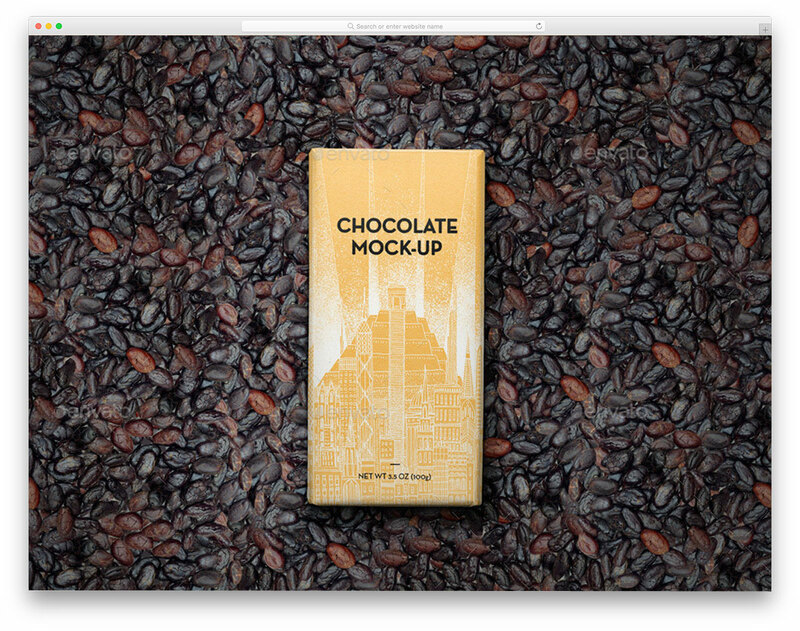 This mockup has chocolates placed in different positions, hence the user can get a clear idea of your design in real-world scenarios. One of the biggest concerns a user has when they try a new online store is the shipping and return policies. Many online store owners take immense care in the mailing package design so that the product will reach the customer safely. If you are a brand store, simply sending a plain package won’t help you impress the customer. 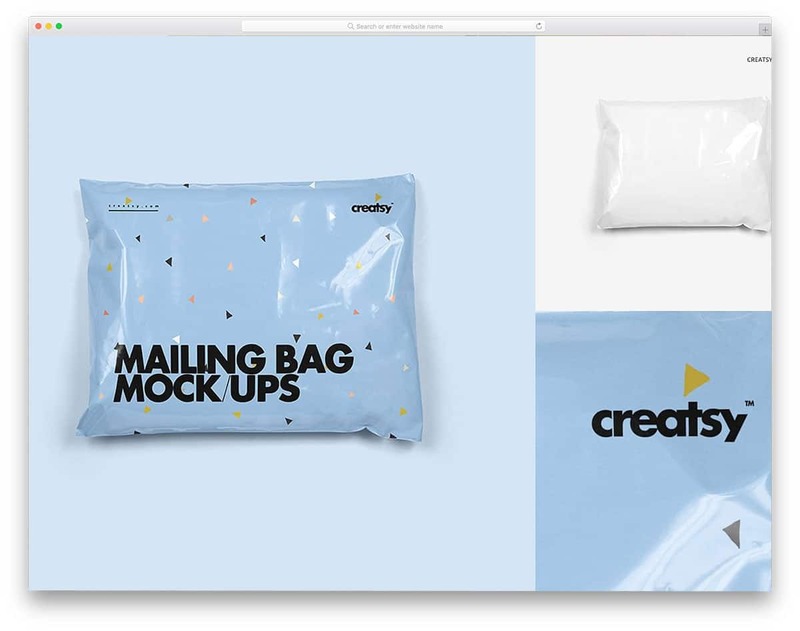 You can use some creative design strategy in the mailbags packaging. If you already created some awe-inspiring design, this mockup will help you present the design elegantly to the users. The creator of this mockup has given you a flexible package design, on which you can add any design without any issues. 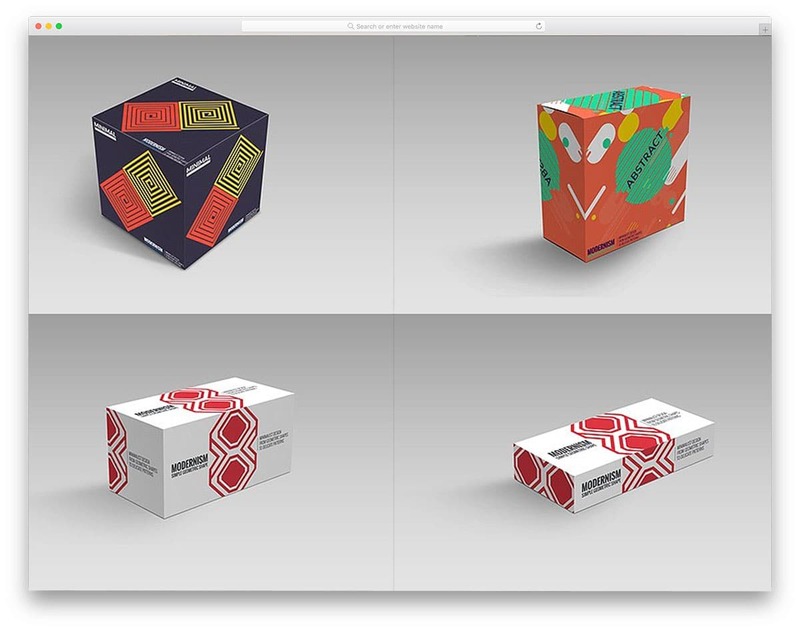 Different angles of the package are given in the mockup for a clear understanding of your design. Box Packaging Package is another loop based box design. The designer of this mockup has given four sizes. 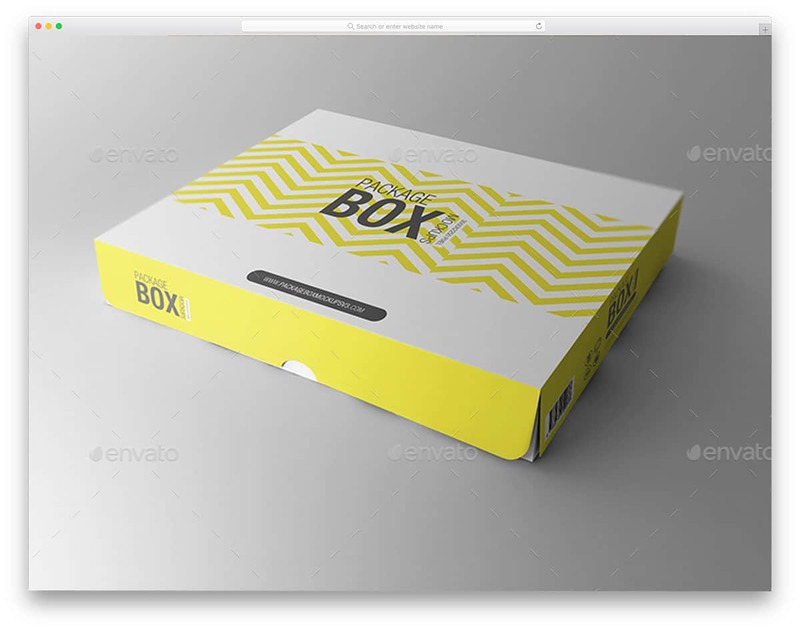 You can add detailing to the box easily with this mockup. The creator of this mockup has handled the PSD layer too well, so you can easily add coloring details. In the download file, you have fully open boxes and half-opened boxes; using with which you can clearly show your entire design to the users. You can customize almost anything with this mockup. For example, you can even change the cloth loop of the box based on your design color. As all the regular sizes are given in this mockup you can use this mockup for almost all types of products. Sometimes minimalism performs better than any other design strategy. In most of the Apple packaging, you can see a minimalistic approach in the box design. Even a small kid can easily pick an Apple package correctly. The clean box itself clearly depicts the quality of the product underlying it. 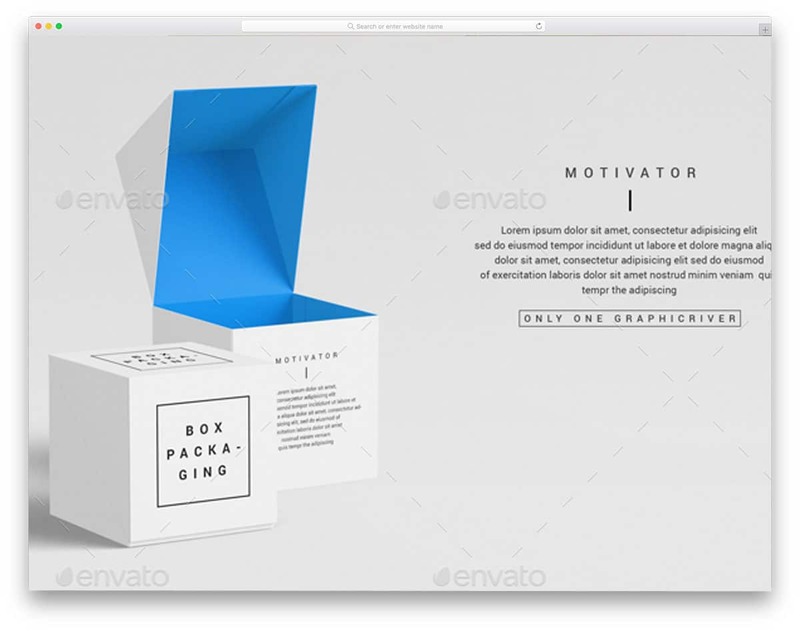 If you are about to create such minimalistic box design, this is the mockup for you. Though other packaging mockups in this list give you a plain design, this mockup is unique. Even if you are a web designer, you can use this mockup in your web page design elements. The high-quality image helps you to easily adjust the image to the size you want. Enough spacing for text contents is also given in this mockup. You can be creative via words in this type of minimal box packaging design. As we have seen before, refill packages are mostly used in food packaging. If you are making any liquid items like juice or drinks, refill packages like this will help you a lot. You can see that most refill packages come in vivid colors. So the designer of this mockup has given you full freedom to customize almost each and every corner of the mockup. You can even use double color design in this mockup without any issue. With this mockup, you get realistic reflections on the package. But, you don’t get the option to choose different types of reflections as you have on other mockups in this list. When we take box packaging design, there are several types in this particular model itself. There is a loop design as we have seen before, sleeve pull design, open type, and pull over design. In this mockup, you get all the basic models. If you are giving multiple designs to your clients, then this is the mockup for you to present your design. All the boxes are given in different angles so you can give a clear view of your designs. The high-quality image enables you to zoom in and show the detailing of your designs. This mockup is the best option for the design agencies and professional designers to present their design elegantly. 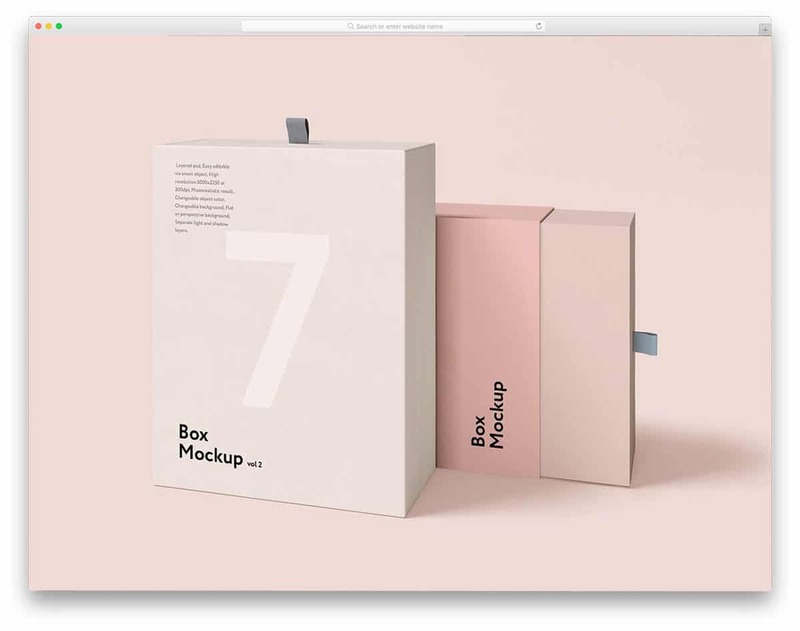 With this mockup set, you also get boxes of all sizes so you can easily use this mockup for any type of product packagings. 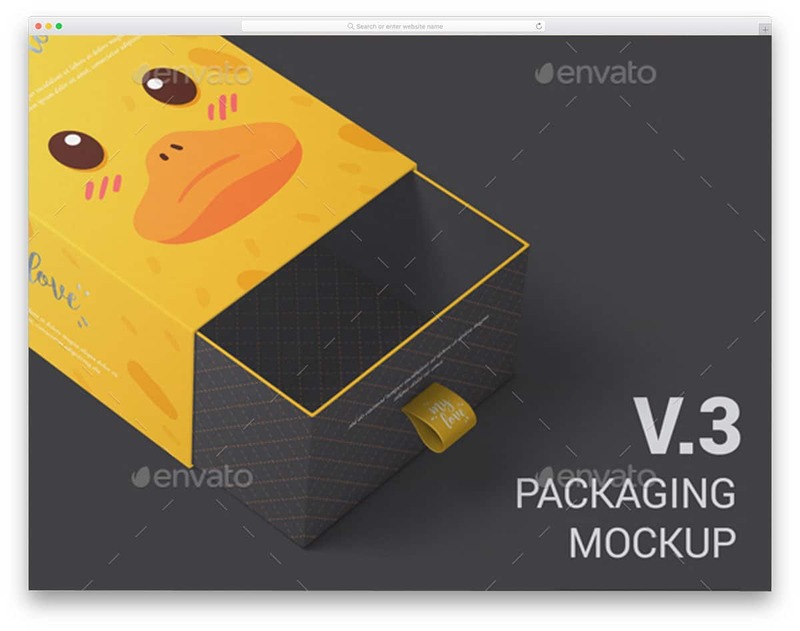 This mockup set is also from the creator of the Package Box Mockups Vol2 mentioned above. You can expect the same level of quality and designer-friendly features. This mockup has more modern looking boxes when compared to the boxes in the Vol2 set. You can clearly so the packaging details to the users. The designer of this mockup has made is ultra-flexible so that you can even change the color of the tags and labels on the boxes. When it comes to branding, every minute details counts. Mockups like this will help you to clearly show your designs and impress your clients. In the download file, you get ten PSD files and all of them are easy to use. Most premium contents won’t give you the demo images used. But with this mockup, you get the link to download the images. Tin packaging is one of the most commonly used packaging models for food packaging and item which needs air-tight design. If you are making any design related to this packing, Tin Packaging mockup will come in handy for you. 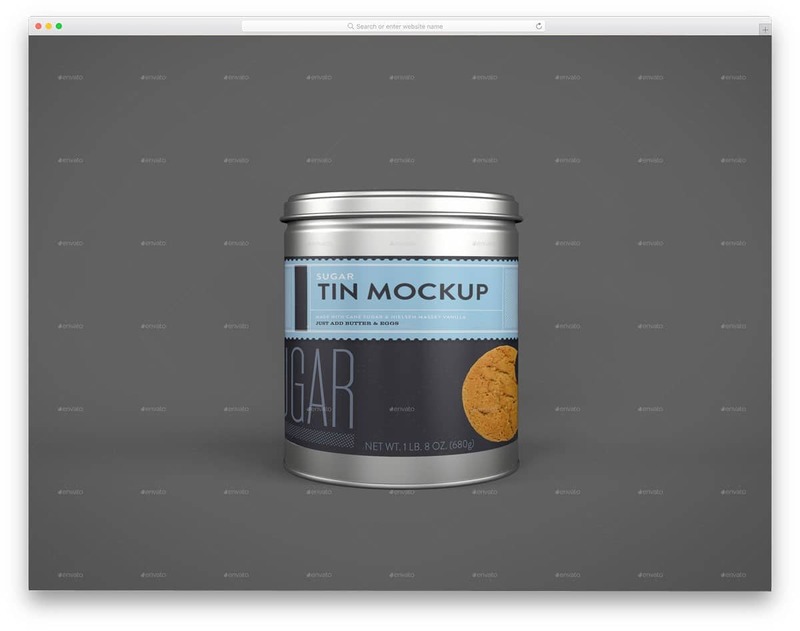 The creator of this mockup has given you most commonly used Tin sizes. Reflections on the tins are also preserved properly, so you get a realistic feel. 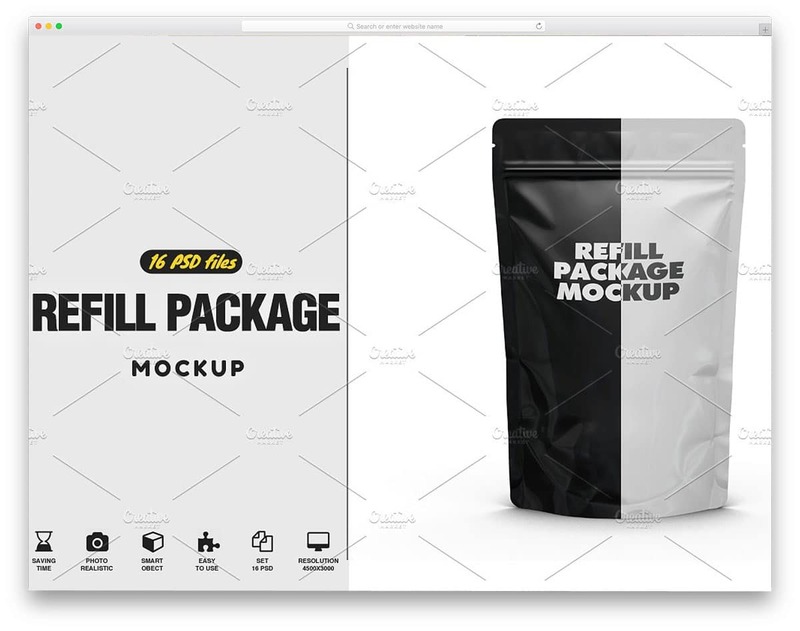 In this mockup set, you get three PSD files. All the three files are easy to edit and the layers are properly organized. You can straight away add your designs and present them to the user. Properly organized layer makes your work simple and saves a lot of your time. Making package design for chocolates lets you open your full creativity. Based on the type of the chocolate you can make luxury feel design to funny attractive design. There is no limit for creativity in chocolate package designing. The mockup for such a versatile, creative-rich design must be able to adapt easily to all types of design. The Packaging Chocolate Mock-Up is one such mockup, which can handle any of your designs elegantly. 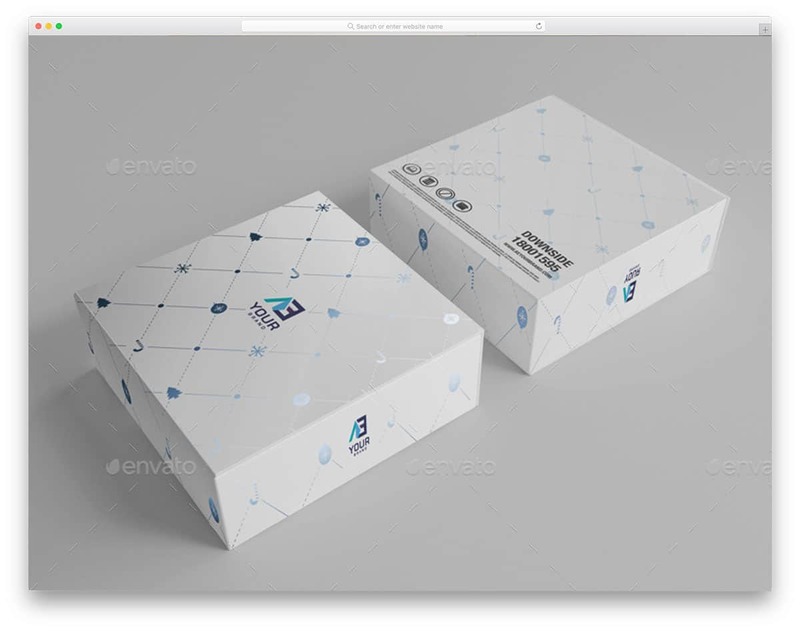 Package Box Mockups Vol1, from the name itself you can get this is another product from the designers of the Vol2 and Vol3 mentioned above. With this box design, you get transparent box designs. The transparent box designs are one of the strategies used by companies to show the quality of the product. One tea bag making company used this type of box with hangers inside to show the tea bags. You can be more creative with this type of packaging design. The designer of this mockup has included different shapes in this set. You can use this mockup for almost all type of products without any issue. 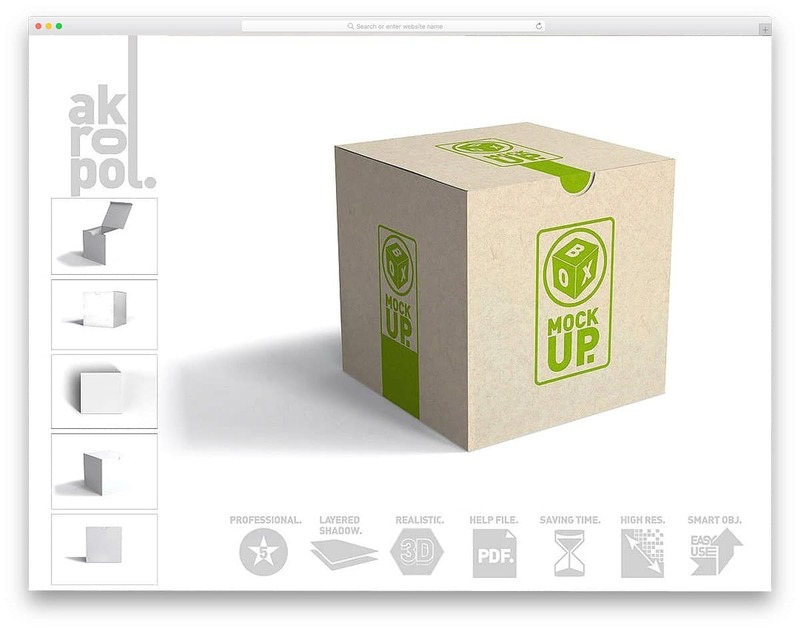 This is another loop based package box mockup. The designer of this mockup has designed it so carefully so you can edit any part of the mockup without any issue. Even the silky nature of the loops used in the box is preserved consciously so that you get a realistic feel. With this mockup set, you get twelve pre-made PSDs. All you have to do is to pick the size you want and start editing the mockup to fit your design. Overall with this mockup, you can present your design neatly without missing any details of the design.